After years of violations, a police officer in Euclid, Ohio, has been fired after he was filmed beating a black motorist during a traffic stop in August. The New York Times reports that Police Officer Michael Amiott was dropped from the Euclid Police Department on Friday. In a statement released Tuesday, Euclid Mayor Kirsten H. Gail said that Amiott had been suspended for “rules violations” following the beating of Richard Hubbard, a 25-year-old welder. But the department continued to receive complaints about the officer—thus the firing. “After a review, I found Amiott to have violated additional departmental rules, including conduct unbecoming and courtesy, calling into serious question his suitability as a Euclid police officer,” Mayor Gail said. Considering the vicious beating Hubbard suffered, as well as revelations of previous misconduct, it’s remarkable that Amiott wasn’t dismissed sooner. The Facebook video that captures Amiott’s violent confrontation with Hubbard is four minutes long and shows Amiott repeatedly punching Hubbard in the face, head and body. At several points, he also slams Hubbard’s head into the pavement. Following the arrest, Hubbard was charged with resisting arrest and driving with a suspended license. His lawyer is filing a motion to have those charges dropped. 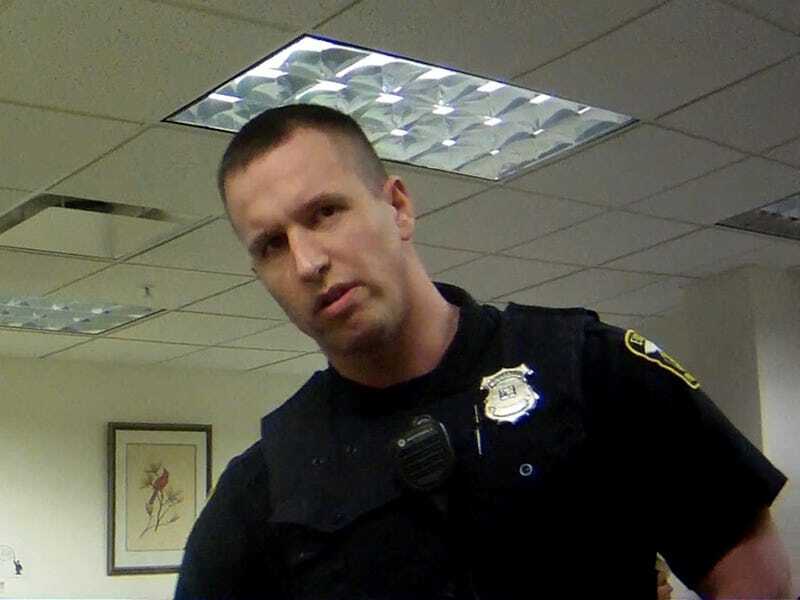 Amiott had received four letters of reprimand and one formal citizen complaint during his three-year tenure at the Euclid Police Department. But apart from written citations, Amiott was never disciplined. The citations listed are appalling. Amiott was reprimanded for pistol-whipping a driver with a handgun, mishandling evidence and losing his temper in front of his commanding officer. He was also involved in not one, but two squad-car crashes. But don’t get too excited about having one less “bad apple” in Ohio. According to James L. Hardiman, the president of the Cleveland chapter of the NAACP, the police union has signaled that it will contest Amiott’s firing.